Writing a novel constitutes a lot of hard work. Starting a novel is even tougher, because the writer anticipates all that work coming up ahead. It can be even more difficult if the previous novel hasn't yet sold. Still…a writer must write, and I've had a story I've been waiting to tell for the last 14 years. It's about a Deaf lawyer and a chimp that have learned sign language, and how the two of them together come to learn the true meaning of humanity. About 14 years ago, while I was still writing Midnight Harvest, I took my kids to the National Zoo in Washington. It was a rainy Wednesday, and the place was almost deserted; far more animals were present than humans. The primate house is enclosed and has a great area in the middle surrounded by the glass-walled cages. The only other visitor was a woman sitting on a bench, making odd motions with her arms. The orangutan on the other side of the glass watched her intently, then made gestures of his own. I had seen enough Deaf people in Georgetown (Gallaudet University is there) to know I was watching two beings communicate in ASL (American Sign Language). I knew about the experiments with Washoe the chimp and Koko the gorilla, but this orang seemed to be an ordinary primate in an ordinary zoo. I asked the woman what was going on. It seems she was a teacher at Gallaudet who had no classes Wednesdays, so she spent those days at the zoo. She said the zookeepers, who had also read about Washoe and Koko, had taken it on themselves to learn a few ASL signs and then to try and pass them on to the caged primates. The original experiments were based on the assumption that other primates have no language of their own, and therefore must be taught from infancy if the experiment is to be a success. If this premise were correct, the zookeepers should have been unsuccessful—but they weren't! The primates appeared to grasp the notion of language immediately, and learned as fast as the zookeepers could teach them. Of course, the keepers were not fluent in ASL and their time was limited. Still, the apes learned how to ask for specific snacks and request favorite TV shows. (The zoo keeps TV sets outside each cage; apes go crazy without something to occupy their minds.) And the orang befriended by the teacher from Gallaudet looked forward to her visits—he knew Wednesday was the day after the Tuesday night TV shows. The teacher was trying to explain the concept of naming days of the week to him, but so far he hadn't quite been able to grasp that point. Let me tell you, dear reader, I was at once excited and horrified. In a totally casual and unexpected manner, I had come face to face with proof that my species is not the only intelligent one on Earth (something I was dealing with theoretically in my novel of alien abductions). On the other hand, that meant that several thousand innocent and intelligent beings are imprisoned in zoos with no hope of parole and no understanding of why they are so incarcerated. I suppose if I were a political activist I'd have staged a demonstration. But as a writer, I felt the best way to bring this to the attention of the general public is to write a story so compelling that everyone will want to read it. Early research including a visit to a home for retired primates near Tampa, Florida, where I saw many Signing chimpanzees and one Signing gorilla. Conditions were terrible; the cages were small, with no TV or toys. Almost all the animals there had been household pets whose owners had died. Most of the apes had succumbed to apathy or worse. By then I had learned a few Signs, though, and was able to greet two of the chimps and receive a return greeting. Most human facial expressions are similar to those of chimps; I wish you could have seen their gratitude at being acknowledged by someone, even for a few moments. I cried all the way back home. Then I took a course in ASL. It is a fascinating language, quite unlike English in many ways. When you read in a report that Koko the gorilla signed, "Me want cat. Cat ball cat," you are reading a word-for-word translation of the Signs she used. This is like translating, "Mi muchacha bonita es simpática" as "My girl pretty is nice." In Spanish as in ASL, words are not placed in the same order as in English, making a too-accurate translation not accurate at all. Koko signs with grace and wit, and a true (as opposed to "accurate") translation of her signs would be more like, "I want my cat; she is like a fluffy ball." In the years since, Koko has been taught to read; she also understands spoken English, although she lacks the physical equipment to produce it. (Gorilla and chimp voice boxes are placed differently than ours, and they simply cannot make the sounds required for, say, English.) Magazine articles are pressured by religious conservatives to make the animals sound like animals, because they cannot accept the idea that we humans are not the only people on this planet. When the apes sound too smart, their funding is cut off. In any case, suddenly today the name of the book came to me and I designed a cover, which helps me to focus. That's it, near the top of this page. 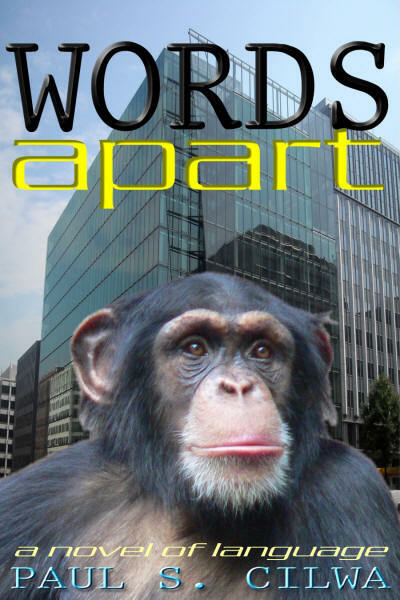 As I write Words Apart, I'll post each chapter and I encourage anyone interested to read it as it comes out, reports mistakes and make suggestions. I hope you enjoy reading it as much as I expect to enjoy writing it!